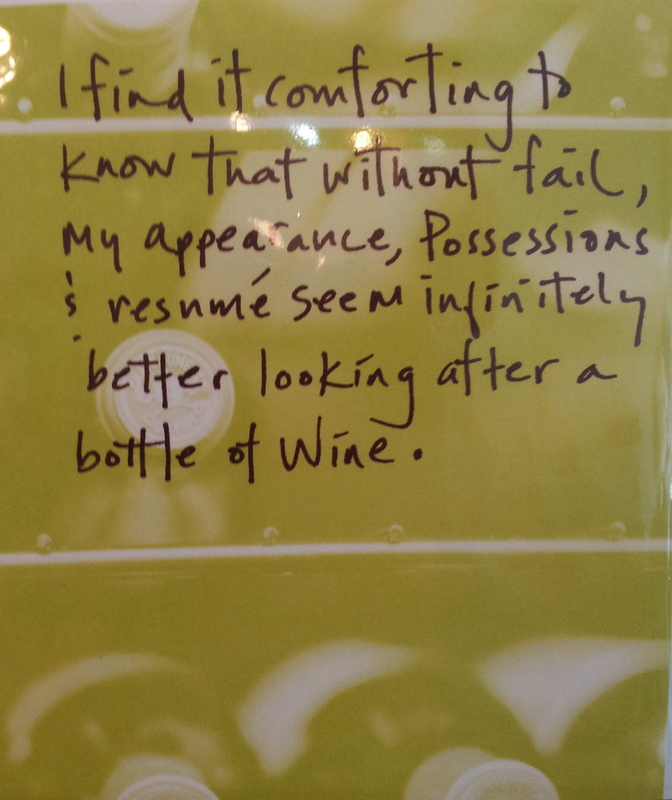 Posted on July 11, 2012, in Words to live by and tagged Gifts, Greeting card, Humor, Wine. Bookmark the permalink. 24 Comments. The secret to a happy life…keep it simple stupid! Or keep it stupid, Simple(ton). Thanks for stopping by! I’d substitute a bottle of Maker’s for a bottle of wine. Just sayin’. I’d switch out the wine for a bottle of bourbon…although I agree with Cristy – why the hell would I be looking at that stuff if I’m zonkered out of my mind? Hypothetically speaking, if it were three in the afternoon, you might be sitting at your desk and contemplating a career change — not that you or I would EVER indulge in a three Manhattan lunch. A bottle of wine actually would have the opposite effect, personally. And I wouldn’t be able to see my self in the mirror, nor read my resume what for all the vomit. It’s a delicate balance, isn’t it? The fine wine line between everything looking better and looking infinitely worse? Which is why God, in His infinite wisdom, gave us the ability to self medicate with Dublin Mudslide, which I still have not found in any grocery store — the urban myth lives on. If wine will improve my appearance, I will go get a case. But will it improve my appearance to others? Maybe I’ll have to hand some out to my friends as well. Either works, both is best. Glad you dropped by! Perhaps your progress toward Noble Drunk status is farther along than I had thought. I don’t understand this card at all. When I’ve been drinking, I don’t even think about my resume. What a way to kill a buzz! Yes but if a potential employer has been drinking, it’s clearly to your advantage. So send along a bottle of Moet with your query is my advice. Wait a minute. Did you read my book drunk or sober? Perhaps a case of Ketel One with the full manuscript would be suitable? I only write while over-served. Like Hemingway, I edit sober. Or as near to it as I ever get. Words of wisdom. I’ll drink a bottle of wine and read my resume… Then I’ll burn it. I’m retired! Now I have all day to try out new ways of slatterndom. I am GREEN with envy. Sloth on! lol “Sloth on” I love it. Thank you! We aim to please.